This afternoon started out like most school days. Usually after school, the kids spread out through the house to decompress and relax. Then later, as the afternoon slides toward evening, I collect the sprawl of them and try to shape the next hour into finished homework and dinner on the table. But today, as afternoon began that gentle shift and the sun cast shadows against the dining room wall, I found Girl tucked into a chair at the big table, reading a book. She had a pillow behind her to cushion the hard back of the dining chair, and her knees were tucked under her chin. The house was still, the TV was off. We had each made a cocoon of comfort in three rooms. Me, in my office, the Boy in his room, and her, here. It was peaceful, a river of quiet flowing right through our house. When I found her, I was just about to say “Time to do your homework,” but I stopped myself. Let her read awhile, I thought. Time enough for homework later. I was touched by all the trouble she had gone to to make herself comfortable, by the way she bent her head toward her book, by the fact that she was so into the story that she didn’t even look up as I passed. I gave her a big yes, the kind that are the most fun when you’re a parent, when there’s no good reason to say no. I grabbed the camera and took pictures and lit a fire in the firepit and took more pictures until the sky turned a smoky gray. Jupiter and Venus peeked out from the loose handful of clouds around them. I abandoned every immediate plan to make dinner. The Boy and I went back inside to find shoes and grab sweaters, but then he got distracted by something in his room, and I stopped at my computer to check something for just one second (I know, I know…). A second turned into a few minutes, and before long I heard Girl calling from the patio door. Good question, sweetie. Really good question. Before long, they were chasing each other around the yard, with flashlights to see, and making shadows of each other on the back fence wall. They danced crazy dances just to see their silly shadows. The funny thing is, they’re usually a little scared to go out in the yard at night. But not this night. From nothing more than a couple of flashlights and their imaginations, they spent the next hour making their own fun and – without fear, without thinking a thing about it – lighting their own way. 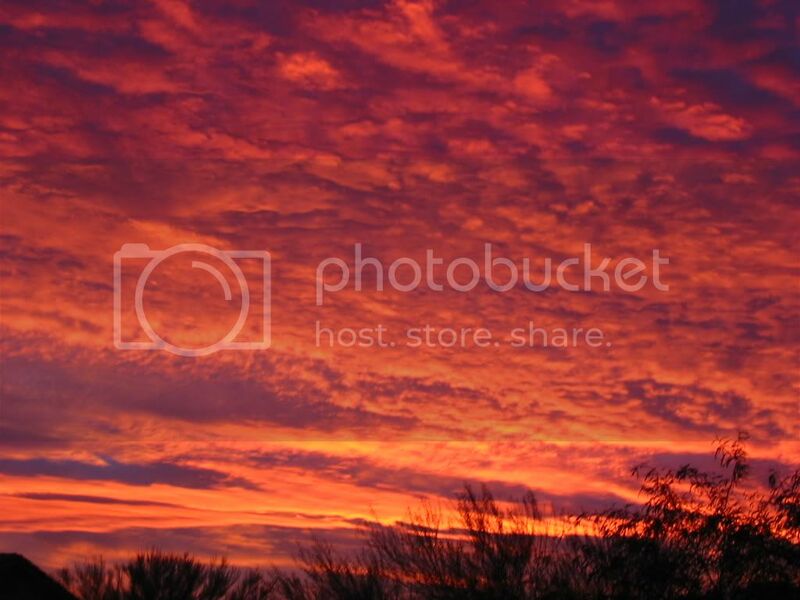 There is NOTHING like an Arizona sunset. Makes me miss Phoenix and Tucson. Gorgeous photos and post. Chriss last blog post..My brother, my friend. And you think you want snow? Girl, you crazy. That is some beauty right there. WOW! The part about your girl enjoying her book made me think of a little girl I used to watch. She would get off the bus on library day with her new book, totally engrossed. She would barely look up the whole way home, and I saw her walk into trees a few times. I loved watching her. The magic of those moments is what keeps us going. I bet they will always remember that evening. beautiful words and gorgeous photos! My Girl is a compulsive reader of books and creator of cozy spaces. Her favorite place to read is at the dining room table, and while it’s too cold for the chimenea now, we used it throughout the fall. Moments like these, questions like these from my kids, always make my mama-heart melt. It reminds me a little of our childhood. You and Ducky and I could all get lost in a book–in a “cocoon of comfort.” (Mine would have been over the furnace vent. The pictures are fabulous. And an unplanned evening of fun and contentment is the best. stunning!!! nature is the original artist! Well the photos are brilliant, but to have that time with your kids, it’s a never recapture moment but you managed it spectacularly! Congrats on Post of the Day mention from David…well done! This is a wonderful story! it takes me back to my own childhood days and the fun you could have without out and about in your own neighborhood at night, with just a flashlight. Thanks for sharing this! Congratulations on making David’s list. It’s so nice for y’all to have had that pause, that down time. It’s so rare to actually stop and smell the roses. Looks like it was a show stopper sunset. Kudos to you for letting it all go for awhile. There will be homework tomorrow and the day after that. How simply beautiful. The sky and the time with your children. Gorgeous photos and even more gorgeous story. That made me feel better, and I wasn’t even there. I love saying yes without having to think about it. 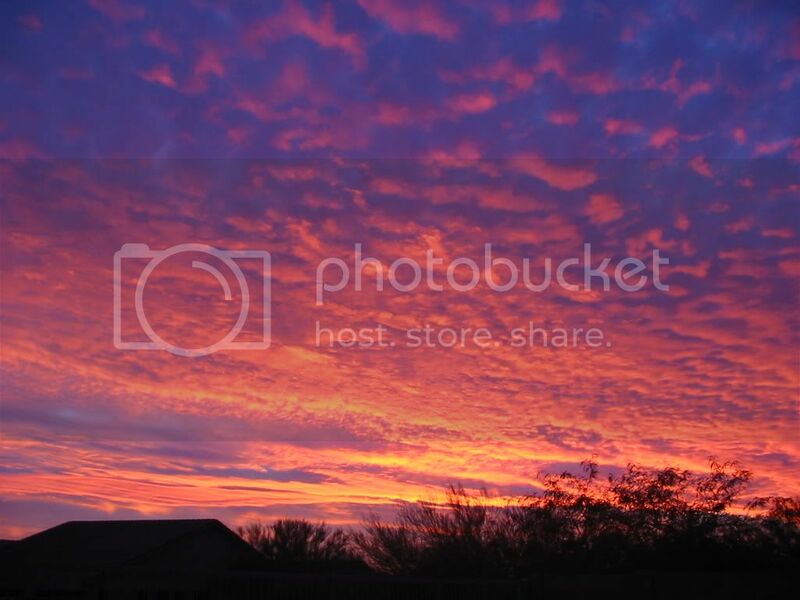 Seriously, this is one of the biggest bonuses of living here in AZ — the glorious sunsets. Truly beautiful. Anns last blog post..Abducted By Aliens, I Was! That sky was so perfect. Wow. The skies here are insanity. What a beautiful post. The fire in the pit, the fire in the sky, the fire in your and your kidlet’s hearts. Just one of those perfect days. Those “yes” moments are among the best. I love your writing. Did I ever say it, just like that? I do. So evocative. I can smell the fire, I can see the flashlights. I am there, in the chair beside you, smiling as we look at the sky on fire. We had a sky a little like that tonight. It stopped me in my tracks. JCKs last blog post..That her son is freebasing…the Christmas season. 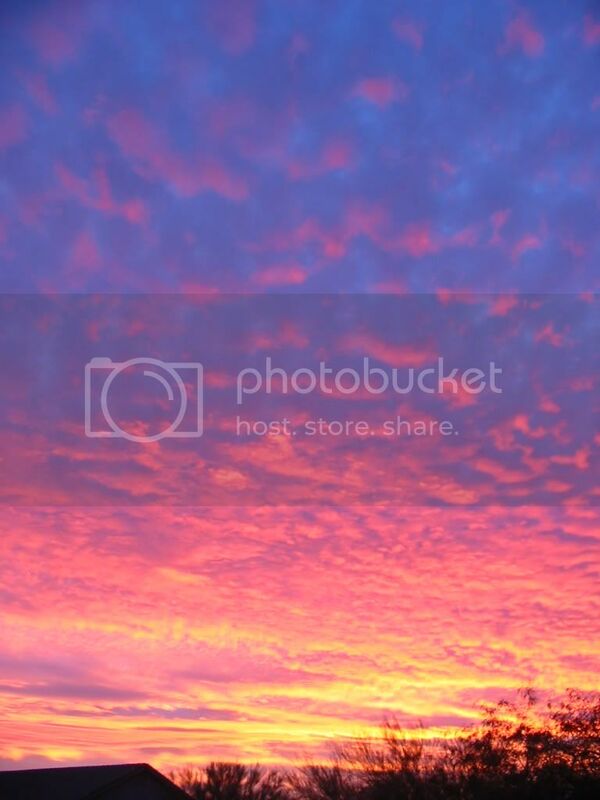 OMG ~~ it looks just like the sky we had here in Redding, CA on the evening of Dec. 7th. I ran around like a chicken with it’s head cut off, trying to locate my camera. Then I realized I was totally missing the incredible view…and just went out and enjoyed it. Unfortunately, I did not get any gorgeous photos like yours and I also never did find my camera (which I use almost daily). Today however, I went out and bought a new one, Merry Christmas to me.